Oxford, Maine - Reid Lanpher of Manchester earned a first-ever Pro All Stars Series Super Late Model win Sunday afternoon in the Speedway Homes 150 at Oxford Plains Speedway. Lanpher won the first heat race to earn the first starting position in the lid lifter at the historic oval track on State Route 26, but it was no easy romp to the winner's circle for the young racer, who swapped the lead with both Turner's Glen Luce and Joey Polewarczyk, Jr. of Hudson, New Hampshire after a couple of restarts. 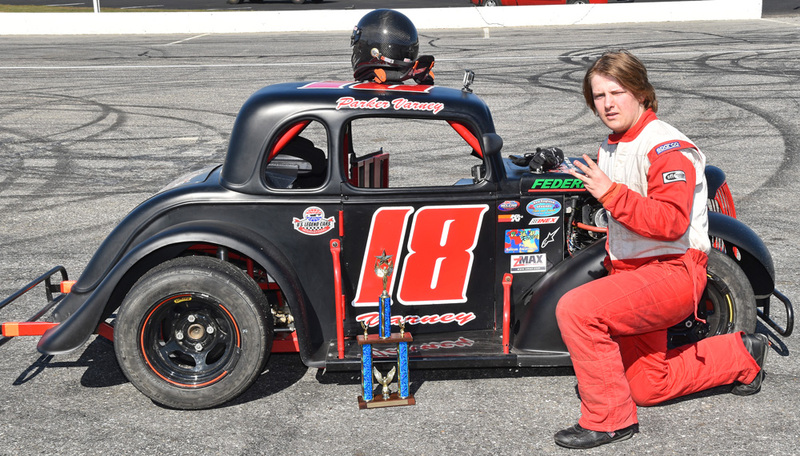 Polewarczyk, a multi-race PASS winner in part-time competition the previous season, looked trong once in front of the field, but about ten laps past the event's halfway point, Polewarczyk's race came to a smoky end with severe mechanical difficulties. 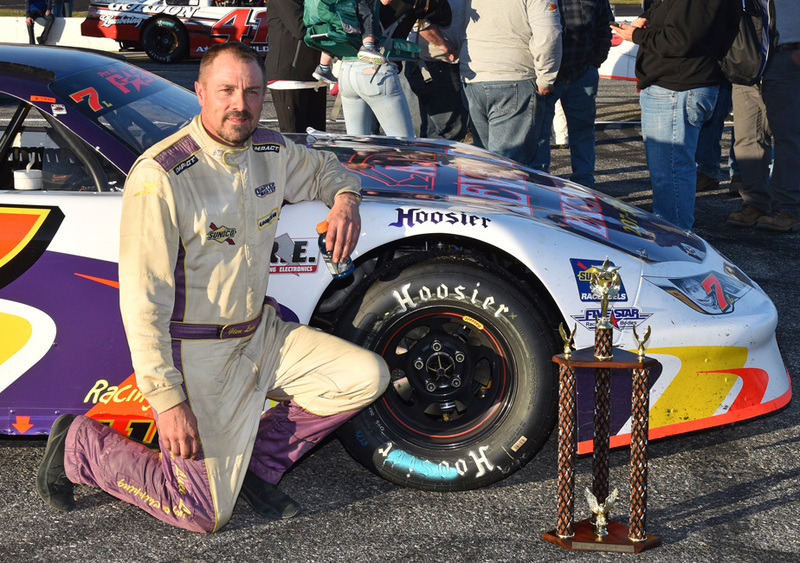 Lanpher reclaimed the lead and battled most of the rest of the distance with Luce, the 2015 Oxford 250 champion. 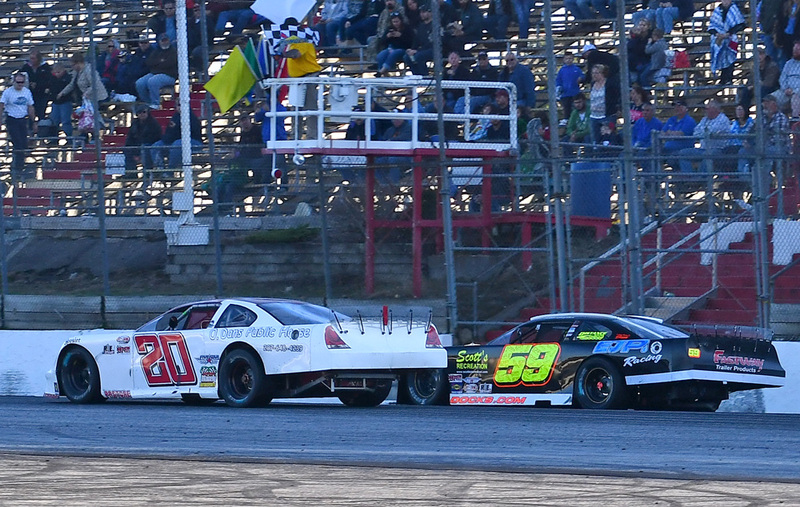 With Lanpher in command through the closing laps, 2016 Maritimes Pro Stock Champion Cole Butcher of Porters Lake, Nova Scotia finished off an impressive change from 26th starting position to claim runner-up honors. Butcher looked strong running inside of outside of the competition in the stout, 40-car starting field. Luce ended up third behind Lanpher and Butcher. 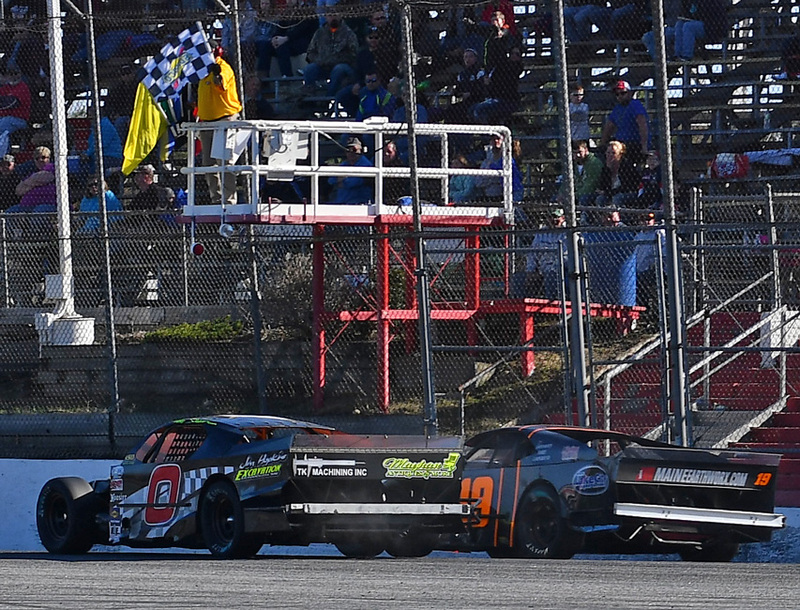 Ben Rowe, the reigning PASS National Super Late Model Champion, battled hard to post a fourth-place finish, in front of Barre, Vermont's Nick Sweet. 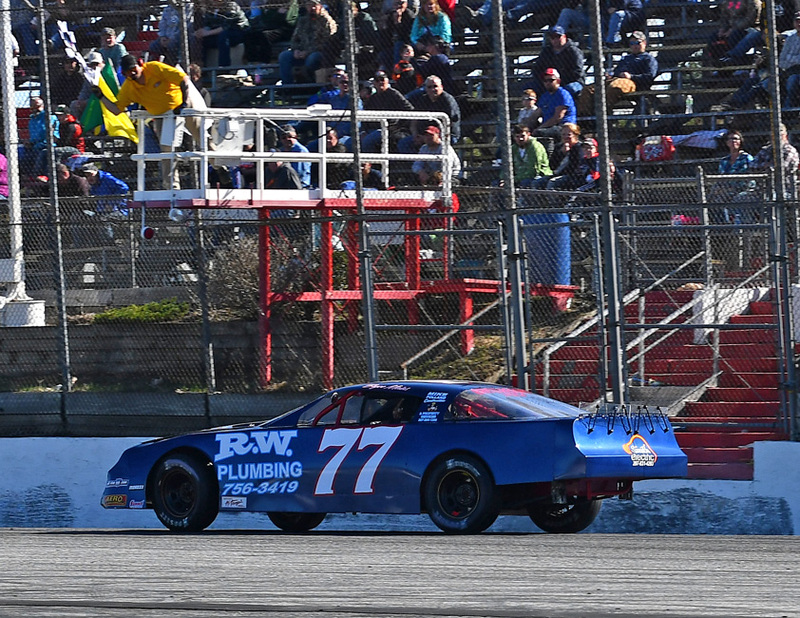 Scarborough's Donnie Colpritt probably passed more cars than anyone en route to a sixth-place finish. Joe Squeglia of Derry, New Hampshire was seventh, Shawn Martin of Turner eighth, Farmington's Cassius Clark ninth and Dave Farrington, Jr. tenth. 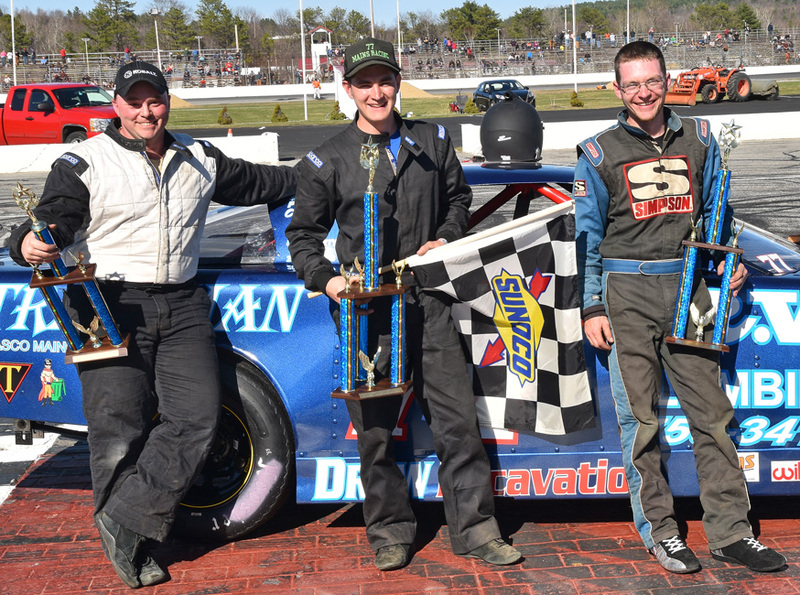 Bryce Mains of Bridgton earned the biggest victory of his Oxford Plains Speedway career with a dominant run in the 50-lap Street Stock race, the first of a special four-race series contested at both Oxford Plains Speedway and Scarborough's Beech Ridge Motor Speedway. 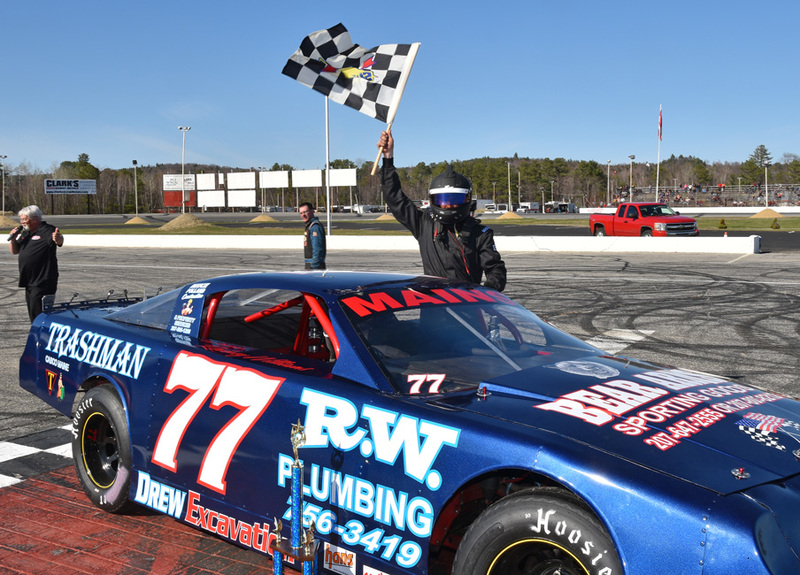 Mains outgunned the division's most prolific winner from the previous season, teammate Matt Dufault of Turner, to take an early race lead that he would not relinquish. Kyle Hewins of Leeds also managed to get by Dufault to earn runner-up honors. 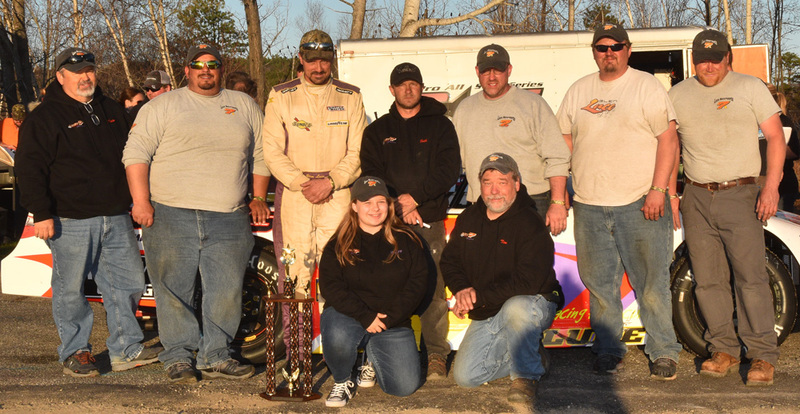 Dufault, who won the 50-lap Street Stock special last season at OPS, did claim the third-place trophy. Kurt Hewins of Leeds raced with the leaders throughout the 50-lapper, and crossed the finish line in fourth position. Greene's Zach Bowie nailed down a fifth-place finish. Dufault and Mains prevailed in the 10-lap heat races for the Street Stocks. 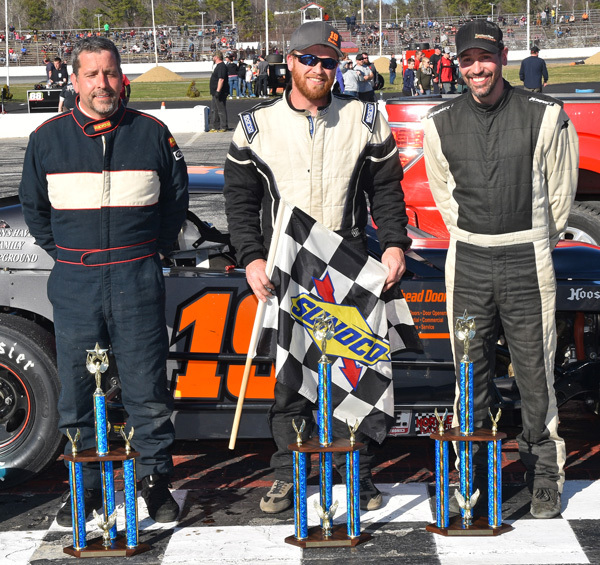 Leading only the final few feet of the PASS Mod feature, New Gloucester's Ben Tinker opened up the season for the open-wheel class with a narrow win over five-time and reigning series champion Andy Shaw of Center Conway, NH. 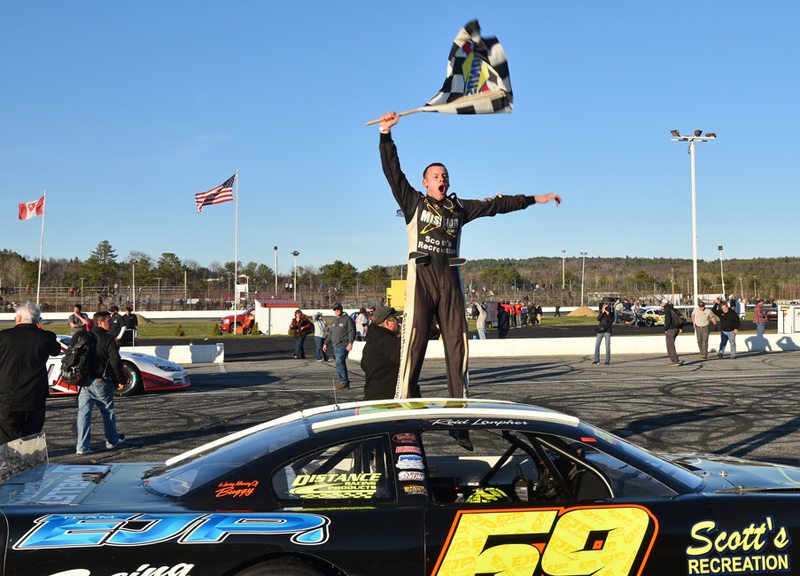 Shaw was out front and looking like a winner when his rear end, which had been lubricating the competition behind him, finally let go a half-lap from the checkered flag. Shaw nearly held on for the win, but Tinker just beat him to the stripe. Gary Shackford of Center Conway, New Hampshire ended a long hiatus from the cockpit of a racecar with a third-place run aboard the Lundblad 28. Shackford dedicated the win to his mother, who passed away earlier in the week. Fellow Mod newcomer Steve Dickey, Jr. of Milford, New Hampshire and Bruce Helmuth of Wales completed the top five rundown. Scott Alexander of Newburgh and Dickey won heat arces for the Mods. 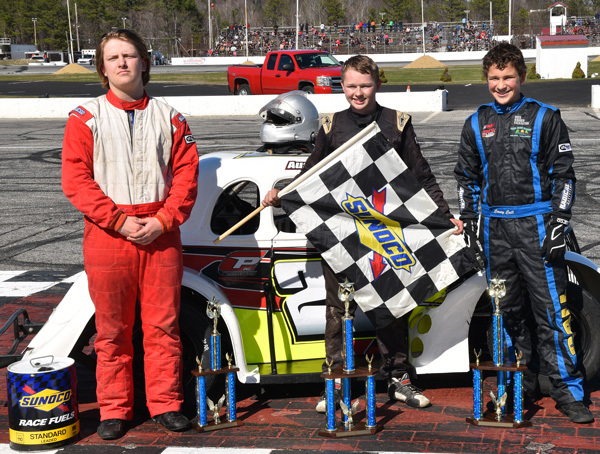 14-year-old Austin Teras of Windham raced to victory in the 25-lap main event for INEX Legends Cars. 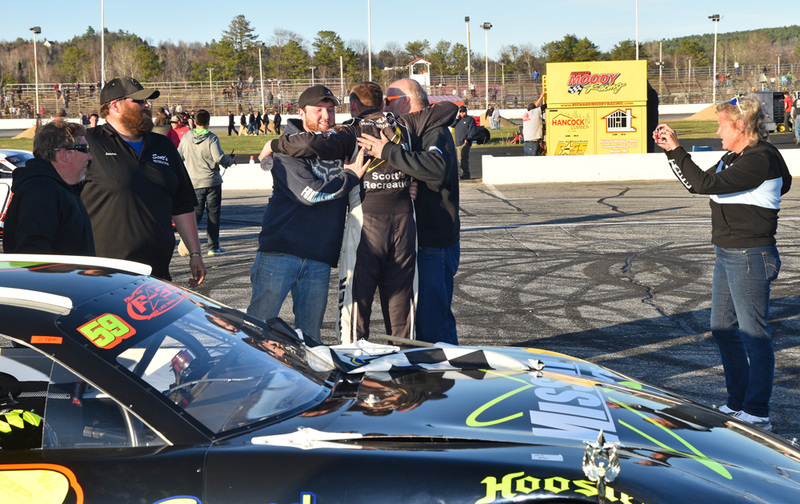 Teras, the reigning Oxford Plains Speedway track champion in the class, outran Pembroke, New Hampshire's Casey Call to the checkered flag after Call bounced back from an earlier altercation in style. Windham's Parker Varney claimed the third-place trophy. 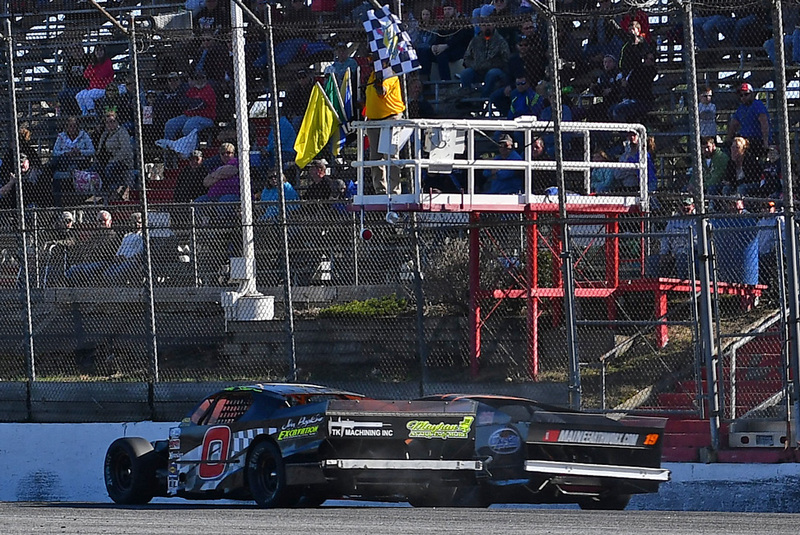 Buxton's Colby Meserve led the race for awhile and ended up with a fourth-place finish. Thomas Everson of Gilmanton, New Hampshire rounded out the top five. 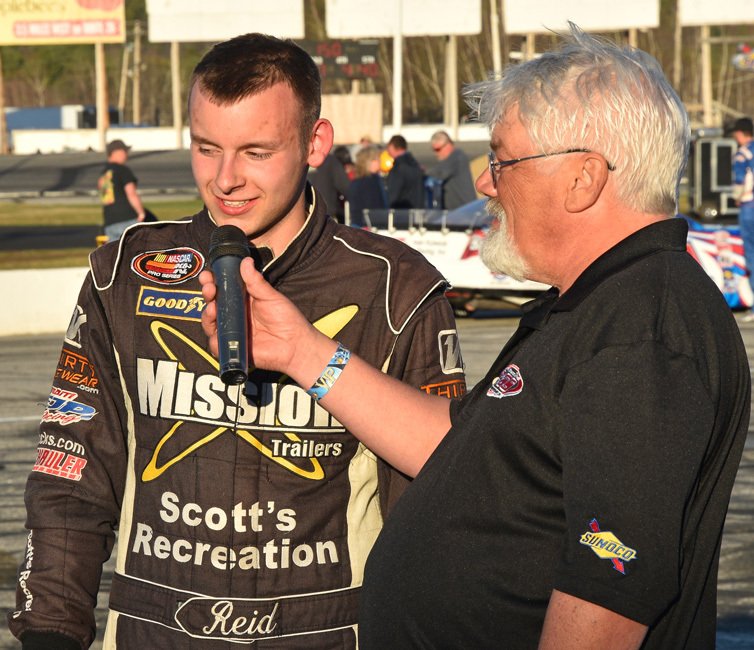 Meserve and Jake Matheson of Hillsboro, New Hampshire won heat races for the Legends Cars. 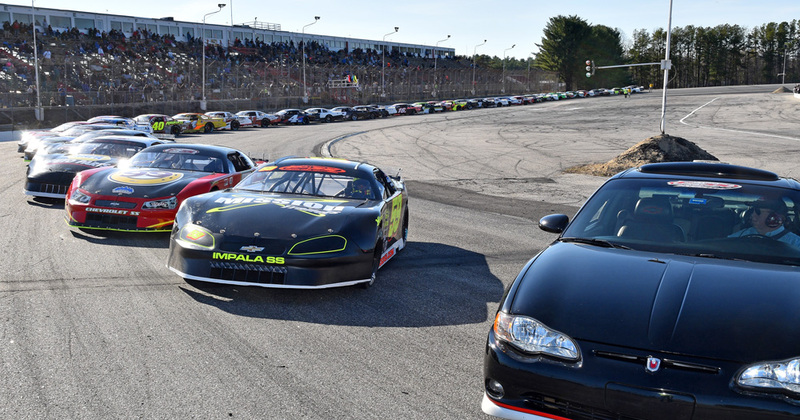 The next Pro All Stars Series North Super Late Model race is the Beech Ridge 300, set for Saturday afternoon, April 29 at Beech Ridge Motor Speedway in Scarborough, Maine. 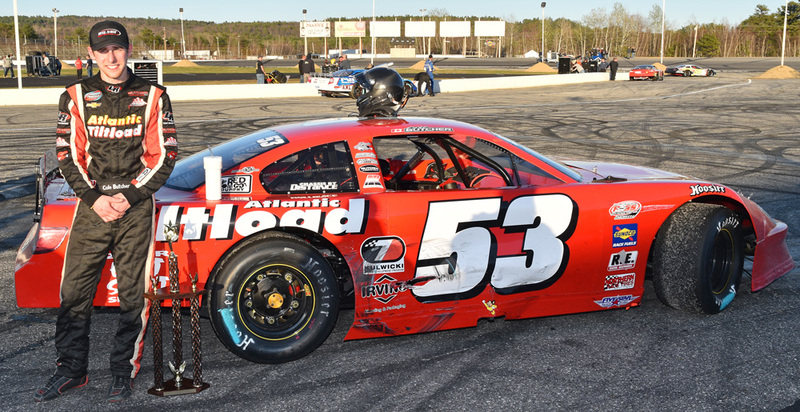 Post time is 2:00 PM for this special event, also awarding PASS Super Late Model National Championship Series points. 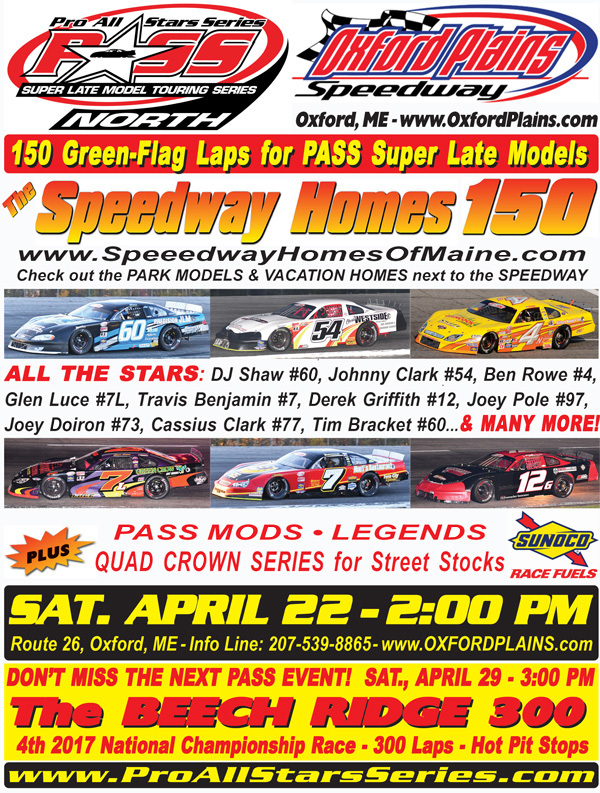 The next race at Oxford Plains Speedway is Opening Day May 7th for the Oxford Championship Series, with Super Late Models, Street Stocks, Bandits and Figure 8 racers all seeing action. Post time for that event has been set for 2:00 PM. 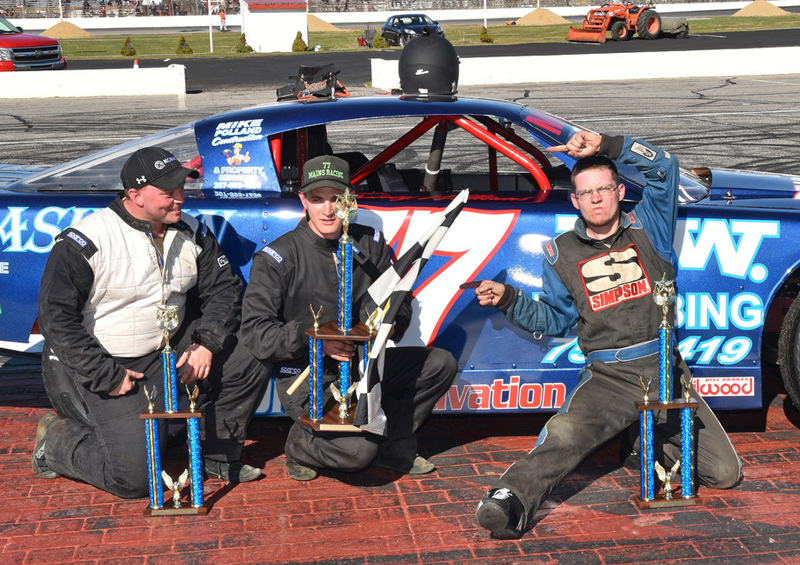 Street Stock Quad Series (50 laps) 1 77 Bryce Mains, Bridgton; 2 51 Kyle Hewins, Leeds; 3 61 Matt Dufault, Turner; 4 55 Kurt Hewins, Leeds; 5 04 Zach Bowie, Greene; 6 58 David Whittier, West Poland; 7 79 Travis Lovejoy, Waterboro; 8 11 Tyler King, Livermore; 9 4 Jordan Russell, Norway; 10 97 Dan Brown, Peru; 11 09 Mark Turner, Norway; 12 36 Richard Spaulding, Lisbon; 13 35 Kristina Nadeau, Buxton; 14 15 Anthony Constantino, Sumner; 15 85 Chandler Harrison, Freeport; 16 2 Adam Lovejoy, Sanford; 17 84 Kenny Harrison, Pownal; 18 28 Dave Cameron, Alfred; 19 5 Ryan Hewins, Leeds. 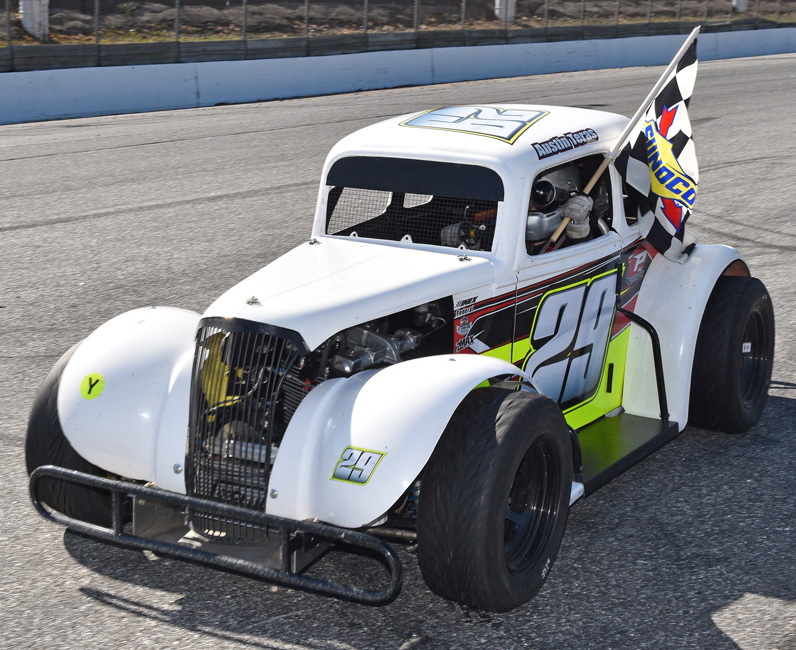 PASS Mods (40 laps) 1 19 Ben Tinker, New Gloucester; 2 0 Andy Shaw, Center Conway, NH; 3 28 Gary Shackford, Center Conway, NH; 4 12 Steve Dickey, Jr., Milford, NH; 5 25 Bruce Helmuth, Wales; 6 17 Scott Alexander, Newburgh; 7 85 Jariet Harrison, Freeport; 8 33 Steven Jones, Saco; 9 12 Jimmy Emerson, Windham; 10 21 Mike Carignan, Lebanon; 11 2 Randy Sanborn, West Baldwin; 12 16 Patrick Sullivan, Poland; 13 5 Devin Curit, Saco; 14 66 Brian McClure, Buxton. 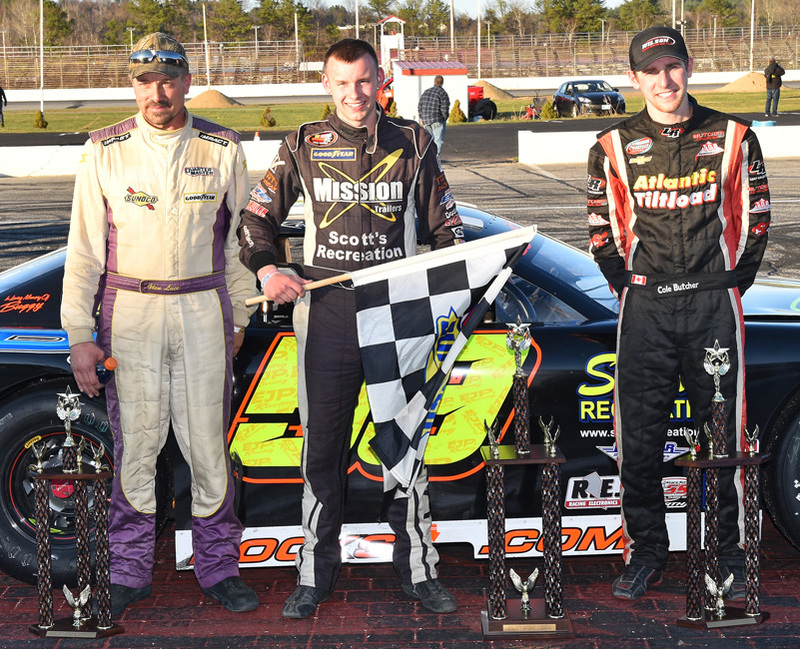 Legends Cars (25 laps) 1 29 Austin Teras, Windham; 2 90 Casey Call, Pembroke, NH; 3 18 Parker Varney, Windham; 4 92 Colby Meserve, Buxton; 5 4 Thomas Everson, Gilmanton, NH; 6 3 Justin Stacey, Hiram; 7 52 Colby Benjamin, Belmont; 8 27 Roger Edgecomb, Hiram; 9 14 Aliyah Neale, South Royalston, MA; 10 0 Annette Humphrey, Parsonsfield; 11 21 Brenna Humphrey, Cornish; 12 52 Jake Matheson, Hillsboro, NH; 13 28 Kevin Oliver, Gray.